Home » Articles » Outdoors » Christmas Nights of Lights Returns to Coney Island Amusement Park! Christmas Nights of Lights Returns to Coney Island Amusement Park! The holiday season is quickly approaching. Which can only mean one thing, it’s time for some Christmas Lights! 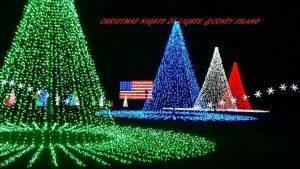 Christmas Nights of Lights returns to Coney Island Amusement Park (6201 Kellogg Ave Cincinnati) this Friday Nov 9 EVERY NIGHT from dusk until 10 p.m. through Sunday Jan 6. Enjoy the new sparkling displays of lights moving to the rhythm of exciting music that have been added to the show this year! Christmas Nights of Lights is one of the most amazing drive-thru Christmas light shows you will ever experience! Over 1 million LED lights, driven by over 10,000 computer channels, synchronized to both traditional and new rocking Christmas music playing through your car radio. Experience this amazing light show synchronized to both traditional and rocking holiday music through your car radio. Visitors of all ages will be awed by the larger-than-life trees, glowing snowflakes, dancing candy canes and fantastic tunnels of lights! In the warmth of your own car, you can sing along to the sounds of the season synchronized to each holiday display. Christmas Nights of Lights welcomes carloads of families and friends to enjoy this Christmas tradition. Admission is $6 per person and children 3 and under are free. Tickets can be purchased online or at the gate upon arrival. Tickets purchased online must be printed at home prior to arriving at the event. Christmas Nights of Lights invites you to celebrate Christmas with them!